This is my latest contribution to Project Vegetable, where I have decided to make 2012 the year of the vegetable in my kitchen. 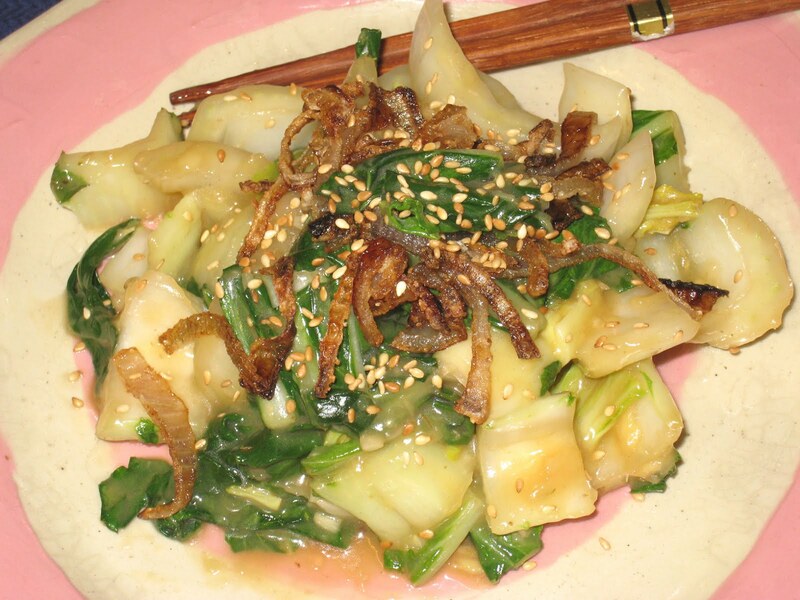 You might think it bears a striking resemblance to my Stir Fried Bok Choy with Almonds, and you would be correct. But there is a slight difference, and it is one worth mentioning. And that difference is the fried shallots. I wanted to add the shallots to the stir fry, but I was afraid they would just disappear into the mix if I cooked them with the bok choy. I remembered an article I had read a few years ago in Saveur magazine about an Indonesian method of frying shallots. In my memory, it was a simple process of slicing a bunch shallots as thin as possible and frying them in peanut oil. I decided to try the method with one shallot. I cut the shallot in half lengthwise, and then each half as thin as I could across the width. The slices were wet and I was afraid they would clump up when I put them in the oil, so I added a heaping teaspoon of cornstarch and mixed them well. My hope was that it would keep the shallots from sticking together, and would give them a little extra crisp. And I was right. I fried the shallots before I stir-fried the bok choy, and let them drain on a paper towel while I prepared the rest of the dish. They made for a crunchy, delicious topping for the bok choy and added only a few minutes to the prep time. The original recipe (which I found online) makes enough of the shallots to last for a few weeks, and calls for an inch of peanut oil. But I found it easy enough to fry them in a tablespoon of oil and to just make what I needed for this dish. And the cornstarch made them extra crispy. Cut a shallot in half lengthwise, and then into slices as thin as you can make them. Sprinkle a heaping teaspoon of cornstarch over them and mix together until each slice is coated. Heat a wok until it is smoking. Add about a tablespoon of peanut oil. Add the shallots and let them sit for a few seconds before stirring them, them stir continuously until they have browned. Remove from the wok and drain on a paper towel. Let cool. This looks really interesting to try! I love all the ingredients of this recipe especially the fried shallots. I will going to make this later after my work. Thanks for sharing this perfect recipe!